The options presented on "Tip of the Day” Popup alert include the “Remove all” and “Ignore” button. However, if you choose to ignore this warning or even click on the right-hand x button, you won’t get rid of "Tip of the Day” Popup alert popping up now and then in the middle of your PC routine. Ignore such fake alerts. 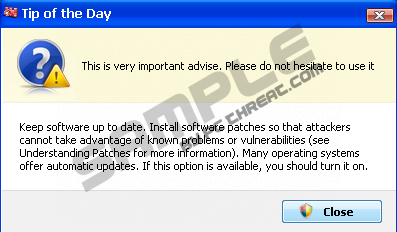 Instead, scan your PC with reliable anti-spyware application and remove "Tip of the Day” Popup from the system. Quick & tested solution for "Tip of the Day” Popup removal.